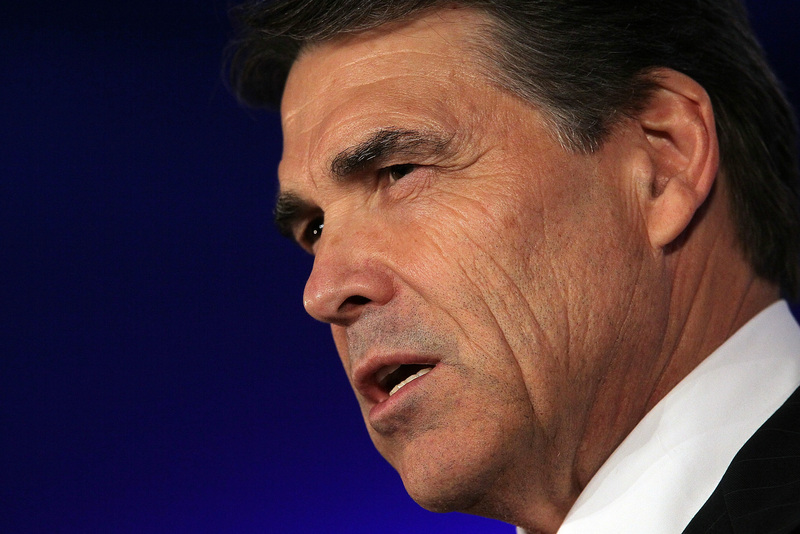 Rick Perry: Cartels and gangs are really "narcoterrorists"
Gov. Rick Perry, R-Texas, praised a group of National Guard troops as the "tip of the spear" in the fight against cartels and gangs as they prepare to deploy to the U.S. border with Mexico. Moreover, Perry said that U.S. officials should "stop calling these criminals nice names like cartels and gangs" and start calling them "what they really are: these are narcoterrorists." Perry announced last month that he was activating up to 1,000 National Guard troops to send to the border to assist the Texas Department of Public Safety (DPS) in fighting drug cartels. They are also meant to help bolster the U.S. presence as Border Patrol agents are overwhelmed with the responsibility of apprehending and holding the more than 60,000 unaccompanied children who have come to the U.S. since last October. "As the Border Patrol is spread even thinner and thinner with this high influx of the illegal aliens, the gaps in the border have become bigger and you now are the tip of the spear protecting Americans from these cartels and gangs," Perry told troops at Camp Swift Army National Guard training center in Bastrop, Texas. "They are spreading their tentacles of crime and fear, so your message and your mission is very clear: To be that visible presence, to deter the criminal activity, contribute those additional eyes and ears to assist law enforcement and Border Patrol agents along the border." He said more than 2,000 soldiers had volunteered for the assignment even though he only requested 1,000. Perry did not say how long the deployment would last, except to call it a "stopgap measure" undertaken because the federal government has failed to secure the border. "This is to be put into place until the federal government can and will do its constitutional duty, which is to put its Border Patrol agents..on the border until the people of this country and the people of Texas are satisfied that the border is secure." "Texans are not going to accept that continual penetration of our border by criminal aliens who are coming into the state, coming into the country and doing harm to our citizens," he said. He has stated before that he expects the federal government to reimburse Texas for the deployment. A state memo obtained by the McAllen Monitor, which first reported Perry's plan to deploy the National Guard last month, indicated the new efforts will cost the state of Texas $12 million per month. Weighing in on national politics, Perry praised House Republicans for their "good faith effort" to pass a border-security bill that would have allocated additional funds to the child immigrant crisis before leaving town for the August recess. The bill - which would have been a non-starter with the Democrat-controlled Senate because it was perceived as weakening due process provisions for Central American children -- was passed after senators had left town without a fix of their own. "We expect the Senate to get back into town. I don't know why they took a five-week vacation without dealing with this issue. Because I'll tell you one thing: the narcoterrorists didn't take a vacation." Perry has eagerly embraced his public role in the border crisis as he looks for ways to raise his national profile ahead of a second potential presidential bid. Part of that effort has involved several trips to Iowa, the first state to hold a nominating contest. The Des Moines Register reported that the Texas governor was well-received in at the Iowa state fair earlier this week despite his disappointing fifth-place finish in the state's Republican caucuses in 2012. "I'm not saying it was necessarily bad. Life is about having experiences," he said at the fair. If he were to make another run at the presidency, he would "be prepared, physically, mentally and intellectually." He said he planned to spend a lot of time in Iowa ahead of the November elections, but was also "multi-tasking" to prepare for a presidential campaign so all the pieces will be in place "when it gets time to make that decision." The governor appeared to enjoy the crowd, too. After giving a speech at the Register's Soapbox at the fair, he responded to the moderator's thanks by saying, "You're welcome. I'm awesome!"